Up until six months ago, Angela was feeling old and jaded. “I was within a year of my 50th birthday and, although I still have quite a good figure, I wasn’t making the most of myself because I was so unhappy about my baggy eyes. I suppose my eyes have always been a bit puffy but since my late thirties, my droopy eyelids just got worse. I couldn’t ever put on eye make up properly and I let myself go really,” she explains. Things are very different now. Angela has recently started a new job as a customer service manager at a large department store. “I now have the confidence to deal with anybody and it’s all because of my cosmetic surgery – six months ago I had eyelid surgery to tackle those droopy eyelids that were holding me back,” she says. A few weeks after Christmas 2008, one of Angela’s elderly aunts died at the age of 92. “I liked Aunt Sheila but I was quite surprised that, when her will was looked at, she had left me £10 000. I was thinking of doing something quite boring with it – like updating our double glazing but a friend suggested that I might use some of it for eyelid surgery. I think they were fed up with me moaning all the time!” she laughs. Thinking about it more seriously over the next couple of weeks, Angela decided to make an appointment to find out more about what was involved. “The operation is actually called a blepharoplasty – which sounds horrible – but cosmetic eyelid surgery is quite a straightforward operation – you only have to be in hospital for a day and then you go home to recover over the next couple of weeks. The surgeon I saw said that I would be suitable and told me all the details, including the risks,” she explains. After chatting things through with the medical team at her local private hospital, Angela then discussed the idea with her two sons, both in their early 20s, who were very supportive. “I decided to go for it and made the appointment at the hospital to prepare for the operation. Before I knew it, it was the day of the blepharoplasty and Angela woke up very early. “I went over everything, all the risks and the possibility that I might end up with eyelids that I still wasn’t happy with but I decided that this was something that I needed to do,” she recalls. Once in hospital, everything went smoothly. Angela was prepared for surgery and the general anaesthetic and was then in the operating theatre for just under three hours. All the incisions were made in the natural folds and crease lines around her upper eyelids and all the extra fat and loose skin that had given Angela the droopy eyelids that she hated, were carefully cut away. 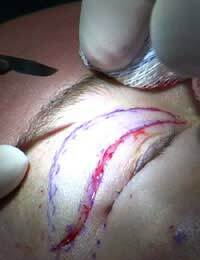 Some fat was also removed through an incision made just inside the lower eyelid, to tighten up the area under the eye too. “Afterwards, I rested in the recovery room and was then allowed home. My sister came to collect me and I stayed the first night at her house as I felt a bit wobbly after the anaesthetic,” says Angela. Her face had some swelling but the surgeon had applied ointment to the skin around her eyes and thin strips of sterile tape to keep the dissolvable stitches in place. “I could see immediately there was a big difference and, even with the dressing strips, I could tell it was a big improvement,” says Angela.